We do stupid things sometimes to protect people. It's weird because there's this duality within us -- this desire to save ourselves and the desire to sacrifice our wishes in order to save someone else. And we're constantly torn between these fight or flight instincts. So we either throw ourselves in front of a bullet (or a bee) in order to protect the people we care most about, or we run away to save ourselves. We don't often think about the consequences of our actions or the long-term repercussions. We often just do first and think later. But what often happens, especially in the superhero realm, when we want to protect the people we care about is that we lie to them. We lie because we want to spare their feelings. We lie because we think we know what's best. But mostly, we lie because we are scared about what would happen if we didn't. Barry Allen has been struggling for a while with telling Iris the truth about his identity. And now that others have joined his crusade (... wait, wrong show...), everyone is finding it difficult to learn how to navigate the blurry lines between the truth and lies. In fact, "All Star Team Up" is really focused on the idea of lying to the people we care about. Is it right to keep secrets? If we keep something from someone we care about, does that make us a terrible person? Does it make us RIGHT? Barry is keeping a secret from Caitlin and Cisco. Felicity, apparently, is keeping something from Ray. Eddie and Joe are keeping a secret from Iris (and Barry is keeping that same secret, too). But throughout this episode, the characters are forced to decide whether they will continue to hold onto those secrets or let the people they care about in, risks and all. So let's talk more about those decisions, shall we? Have I mentioned how much I love Barry Allen and Felicity Meghan Smoak together? No? Because I do. If I could have them in every episode of The Flash and Arrow together, I would. I really would. Here's why: these two GET each other in a way that no other two characters really do. They're friends, but they're more than that, actually. Barry trusts Felicity because he trusts her judgement (UNLIKE A CERTAIN CURRENT BOYFRIEND OF HERS, AHEM). He relies on her and she's his confidant. He tells Felicity about Dr. Wells during this episode and his suspicions (thanks to Joe's influence) that Caitlin and Cisco might be working with their mentor. What Felicity does, meanwhile, is what she always does: remind Barry of who he is and who he isn't. Barry isn't the person who can do life by himself. And funnily enough, she said the exact same thing the first time she visited Central City. Felicity reminded Barry that his fears aren't valid. She told him that what he should really be afraid of is what will happen to him if he shuts other people out -- the people he needs most. When Barry and Felicity have a serious heart-to-heart near the episode's end, she tells a story about when she first met Oliver. He lied to her. Repeatedly. And badly, she reminds us. But she always trusted him. Why? Because he was a good person with a good heart. Felicity reminds him that Caitlin and Cisco are exactly the same. They're GOOD people and they care about him so much that they risk their lives on a daily basis to protect him. He needs to let them in. He needs to trust them. Because the moment he stops -- the moment he starts trying to do the superhero thing alone -- is the moment he ends up as angst-ridden as Oliver. And Barry IS angst-ridden at the beginning of the episode. It's brilliant because Felicity picks up on this almost immediately. She is so in tune with Barry's personality that she knows when he's lying, knows when he's hiding something, and knows when he's afraid and nervous. And he knows he can trust her. In the swirling mess of tangled webs of lies and half-truths, Barry is completely honest with two people: Joe and Felicity. This week in "All Star Team Up," the secret that Barry is focused on most of all isn't that of his identity but that of his theories regarding Wells. He doesn't know if he can trust Cisco and Caitlin and it's not until Felicity reminds him of where she's been -- of how she's learned to lean on and trust the people she is with -- that Barry allows Caitlin and Cisco to see the board he's made about Wells and his identity/motives. I loved this Barry/Felicity story. Why? Because who else would understand better what it means to rely on people for life or death situations than the woman who works with Arrow, Arsenal, The Canary, and Dig in the field on a weekly basis? Felicity knows the value of honesty but she also knows its proper place. And though she advises against hiding information from Iris (more on that later), she's fully aboard the idea that Barry needs to let Cisco and Caitlin in. Again: why? What makes Cisco and Caitlin different from Iris? Well, Barry works with them. And I think that Felicity sees bits of Oliver in Barry -- she sees what he could be if he shuts other people out. And she doesn't want that for Barry; if she can prevent him from having the same experiences Oliver did, she will, every single time. Because first and foremost, Felicity is the harnesser of light. No superhero can save the world alone. And no one can do it in the dark, either. It is interesting, though, that Felicity knows secrets have their place. She doesn't seem to be an advocate for 100% honesty, because she also knows the value of picking and choosing your truths -- she's seen, as I've said, far too many examples of what happens when the truth gets into the wrong hands. And I think that Barry knows this, too, which is why he takes Felicity's words to heart. Good boy, Barry. Good boy. If you read my Arrow reviews, you all know how I feel about Ray Palmer, so let's not re-hash all of the problems that I have with him. Instead, let's discuss -- briefly -- the story between him and Cisco. Cisco Ramon is such a great character. He really is. And "All Star Team Up" found my favorite Central City native helping Mr. Palmer out with his suit. The two bonded over it, which is pretty great, but Cisco was also dealing -- throughout the episode -- with memories of the other timeline ("Wait, there are other timelines?") where he, you know, DIED at the hands of Wells after the man revealed he was the Reverse Flash. It's jarring and terrifying for the young man and it throws him off his game, of course, in the field. But what's so great about Cisco in this episode is that he's the most determined and heroic I've ever seen him. And it's for a complete stranger. Cisco saves Ray's life. He takes a poisonous bee for a relative stranger and I had to wonder why, exactly, he would do that. But it goes back to what I opened the review with, doesn't it? We can choose how we respond to a crisis. We can choose to either run or to fight -- to flee or to protect. What we do in that moment reveals who we truly are. And there's something about Cisco Ramon that we should know by now and that's extremely evident in this episode: he will do anything to protect people. He's a good person. He's a person who tries to always do the right thing. And he's a person who will face his fears and possible death for a near-stranger because THAT is how Cisco proves his loyalty to you. He is the true definition of a "ride-or-die" friend. If he is on your team, he is ALWAYS on your team. Ray and Cisco bond over the A.T.O.M suit and repairing it. But I think the fact that Cisco was willing to risk his life for Ray proved to Barry exactly what kind of person Cisco was. I have no doubt that Barry trusted his friend implicitly. But this event allowed Barry to see exactly how deep Cisco's loyalties lie when he's in your corner. He will fight for you. He will face his fears for you. He will lay down his life for you. If Cisco believes in you, that's all you need. It was lovely to see some Ray/Cisco moments (the latter made the former bearable and that's not an easy feat) and the other Cisco moments throughout because they were such a great example of Cisco's character and his values. There's a little bit of a logical fallacy in Iris' reasoning to Eddie at the end of the episode. She tells him that: "When you love someone, you tell them everything." That's... not entirely accurate. You can love someone and not tell them everything about you. Conversely, you can not love someone and keep secrets to yourself. What Iris says at the end of the episode directly ties into what the group (Eddie, Barry, Iris, Felicity, and Ray) discussed over dinner: Ray believes that you need to tell everyone everything; Felicity, meanwhile, expresses that it's healthy to keep some things private. You don't have to divulge every secret to your partner. In fact, throughout the episode, Felicity is an advocate for protecting Iris by not telling her about Barry's secret identity. Eddie wants to tell Iris all about who Barry is, but Joe forbids it. So Eddie listens to Papa West. Why? For a few reasons: 1) He does desire to protect Iris. For as much as people ridicule the decision for the group to not tell Iris about Barry's secret identity, they seem to forget that Iris is the only person unable to protect herself. Eddie and Joe are cops with years of training. Caitlin, Cisco, and Wells have each other and S.T.A.R Labs. Iris? Iris would easily be used as leverage by any villain and she wouldn't exactly have the resources available to protect herself. Keeping Iris in the dark may seem like it's stripping her of her agency, but what's the alternative? To tell Iris the truth and place a target on her back? Iris' logical fallacy is just that -- a fallacy -- because it assumes that loving someone and being totally honest always go hand-in-hand. If that were true, Barry/Iris shippers have a big problem on their hands because Barry has been lying to Iris. Does that mean he doesn't really love her? Same with Joe: are we to assume that Joe's love isn't genuine? Or Eddie's? Of course not. Barry assures Iris that Eddie isn't cheating on her, which was her fear. And yet, even when he does assure her of this, she insists that if Eddie cannot tell her what he's hiding, he must not really love her. That presents problem 2) Eddie's secret is not his to tell. Remember the time Felicity told Barry who Oliver was? That was because Oliver was DYING and needed Barry to save his life. Eddie isn't going to tell Barry's secret because... well, it really isn't his secret to tell. And I get that. I really do. I understand why Eddie chooses to not tell Iris but recognize the importance in the fact that he WANTS to tell her. Eddie isn't a bad guy. In fact, he's kind of a great guy. He's the person in this episode who has known about Barry's secret for the least amount of time and he's the only one being eaten alive by it. He doesn't like lying. He can't be a liar when it comes to Iris. But he also can't tell her the truth because losing her temporarily will hurt less for him than if he were to tell her and lose her permanently at the hands of some metahuman. I'm a bit surprised that Felicity advocated for lying to Iris, but I also am not: she's the one who deals with Oliver on a daily basis. The truth is important. Don't get me wrong. The truth is VERY important. But Felicity has seen what happens when a little truth gets in the hands of the wrong people. She's watched people close to her die for the truth -- die because they knew Oliver's secret. And she cares about Iris. It's important to recognize the fact that Iris is not being given a choice in the matter because everyone knows what she would choose -- she would choose to stick by Barry. Everyone else didn't really get a say in whether or not they knew Barry's secret identity, right? He appeared to them. He revealed himself. Once you know something, you can't un-know it. And so in this convoluted way (and I'm not saying it's not convoluted or that it's right that they're lying to Iris -- literally everyone at this point is), the people lying to Iris want to prevent her from being forced into that knowledge. They want to keep her in the light. (I could go into a whole metaphor thing, you know, about how this is a subversion of the phrase "being kept in the dark" because even though Barry tells Iris that Eddie is trying to keep her in the light, everyone is really keeping her in the dark, etc. etc.) And so they choose to lie. It hurts them all in different ways, but it hurts Eddie the most. Actually, it hurts Iris the most. Iris is an idealist, though, and that's not a fault. Not really. She wants everything to be concrete, cut-and-dry. It's because she's a journalist and I get that. I get HER: I understand that to her, there is either a truth or a lie; there is no grey area. But in life, grey areas exist. And I feel for Iris, I really do. Because she doesn't really know what's happening. All she knows is that she can't trust anyone anymore. And that must be painful. I still can't completely connect with Iris and I'm not sure what it is (theory: she's still far too underdeveloped for my liking and needs to be written better and more well-rounded because at the moment, she kind of just flits around in the background waiting to be in scenes with Barry or Eddie or Joe -- wasn't she investigating Wells? Did that stop? Did I miss something? ), but I hope the show fixes that problem next season. Who can you trust, really? Isn't that the whole focus of this arc on The Flash? If people are liars, does that mean they're incapable of protecting you? If people are protecting you, does that mean they always have your best interests in mind? How do you navigate life's grey areas? How do you navigate the boundary between secrets and truth? There's no easy answer and "All Star Team Up" doesn't seek to provide one. All it does is remind us that we have a choice: we can protect, or we can run away. Which person will you bee? If you've noticed, this season I've reviewed the episodes of The Flash where someone from Team Arrow crosses over (specifically Felicity). This summer, I'll be working to review the entire first season so stay tuned for that! I didn't like bees when I started this episode and now I like them about ten times less. I still might ship Barry/Felicity a little bit, you guys. I really enjoyed Emily Kinney's brief appearance in this episode as Felicity's nemesis. I think I need to see more of these hacker queens dueling in the future. "That ain't something you should be showing people." JOE WEST, MY FAVORITE HUMAN BEING. I really love the Eddie/Barry/Joe team-up, you guys. "Bees? Why did it have to be bees?" Felicity appearing on any show automatically makes that show 100000% better. "... God, there's two of them." "Well, I'm her father." "Well I'm her boyfriend. When does my vote outweigh yours?" "When you become her husband." Oh snaps. "I thought Central City was supposed to be the fun one." "WOW. So everyone but Iris?" "Feels like that, yeah." HAHAHAHAHAHAHAHA. "Bee careful. Bad pun, sorry. Just... don't die." "Too much?" "Just a tad... sweetie." Felicity looks very good in red. Also, I love her hair in that dinner scene. "It's not as creepy as it sounds." FUNNY, BECAUSE IT ACTUALLY IS AS CREEPY AS IT SOUNDS. I'll say it until I'm blue in the face: Felicity Meghan Smoak needs to start a practice specializing in superhero therapy. The fact that Felicity told Barry a story about when she first met Oliver and why she trusted him (because she could see he was a good person with a good heart) basically solidifies the fact that she's in love with him. She really does truly love him. "It's probably because he wants to keep you in the light." "All I ever want is for you to be happy." I see your not-so-subtle parallelism between Oliver talking about Felicity and Barry talking about Iris, show. The fact that Felicity still thinks about Oliver's body though. Let's not lose sight of that. The bee puns were SO heavy-handed in this episode. It was like the boomerang episode all over again. Seriously. "The Atom lives!" Is it bad that I said: "NO" immediately after that? "BOOM! DROP THE MIC!" It's like I couldn't love Felicity Smoak more if I tried. "Either my fear of bees is over or it just got a lot worse." I just recently found your blog, and I'm so glad I did! You watch a lot of the same shows I do and I'm always interested in hearing other people's opinions. One thing I'm curious about in this post: why is it you think Iris will only have a target on her back once she finds out about Barry's identity as The Flash? It seems to me, she's a target regardless. Captain Cold, for example, knows Barry's identity. What's to stop him from targeting Iris as Barry's foster sister the next time he's in town, regardless of her knowledge. Weather Wizard already DID target Iris, though it was because of her relation to Joe, not Barry. 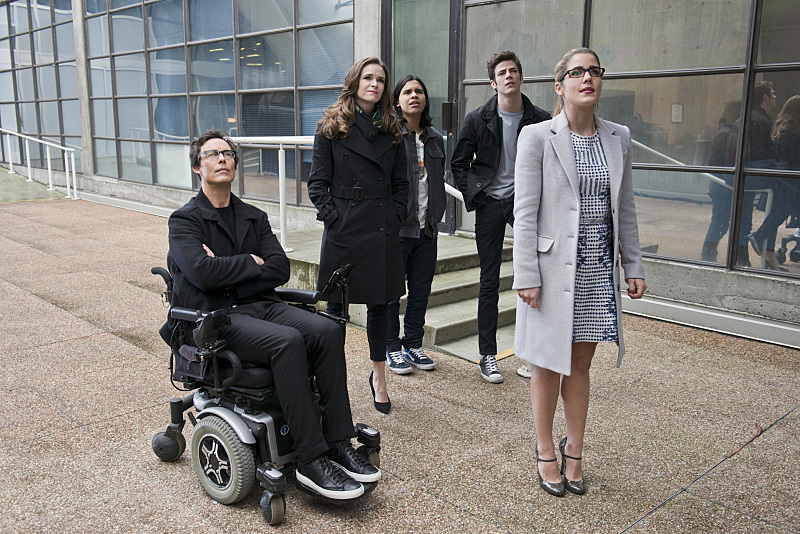 Barry and Joe - and now Caitlin, Cisco, and Felicity - all think Harrison Wells is the Reverse Flash. How does Iris' lack of knowledge protect her from RF maybe deciding to target her as a means of keeping Barry and Joe in check? To be fair, I don't necessarily think Iris finding out everything will magically make her safer. But there is power in knowledge. There is safety in being prepared. Her knowing Barry's secret won't necessarily make her any safer or any less of a target. But her NOT knowing, I think, does make her less safe. Grat recap. I'm sure I'm going to be visiting your blog an awful lot! One thing I'm curious about in this post: why is it you think Iris will only have a target on her back once she finds out about Barry's identity as The Flash? The way that I see it, Eddie and Joe (and Barry) are preventing doing to Iris what Oliver had to do to Felicity in "Unthinkable." In that episode, the unthinkable thing that Oliver did was put Felicity deliberately in harm's way -- put the love of his life in harm's way -- in order to defeat Slade. Oliver had no other choice, though, right? This was the only way he would be able to outsmart him. Had there been another way, he wouldn't have ever dared to put Felicity in the crosshairs. I think the same applies to Iris: they're choosing to keep her in the dark because it means keeping her deliberately safe. Yes, even if she doesn't know about Barry's identity, she will still be in danger sometimes. But the difference here is that they would be DELIBERATELY putting Iris in danger, rather than incidentally putting her in danger. Does that make sense? I think that's their reasoning -- Iris may be in danger at some point, but the difference is that they're not intentionally going to put her in danger by telling her about Barry. Good stuff! I think Barry and Felicity have the most well written relationship across both shows. I love watching them and would ship them in a hearbeat. They are true equals. More than Felicity is with any other man in her life. Which is what makes its negativity about Raylicity more than just the fact that he's not Oliver. It definitely has to do with how they wrote Ray, and Felicity when she is around Ray. Also dont buy the Iris/Eddie secrets bit. Just a way to make them break up. And i really disliked the line where she said Ray was Oliver's body and Barry's brain. Uggh, that is such a disservice to Oliver and how what she feels for him is so much more. She is trying too hard I think. The reasons for loving someone and being in a relationship with them are not a simple pro/con list and she is not going to reason herself into being in love with Ray. Thanks for your comments, Sarah! It definitely has to do with how they wrote Ray, and Felicity when she is around Ray. I will probably write a post-season three analysis on WHY Ray Palmer was problematic and how it had nothing to do with me shipping Oliver/Felicity and everything to do with the way he was written. Which is why I sincerely hope she's the one to realize it and break it off, not Ray. I don't want Felicity hanging onto this relationship and I'm hopeful "Broken Arrow" will reveal how much Oliver and Felicity love each other and will allow Felicity to make that choice, like her mom said. I liked the phrase from Bree “the sting of betrayal” to describe the themes of this episode. It really hurts when one's trust is betrayed and so many people are feeling that and struggling with who to trust and how much to tell them. Because of those connecting links even the stuff with Bree Larvin and Dr McGee, which was a fairly small part of the episode, felt connected. It was a really well structured episode and you are right; any appearance of Felicity Smoak makes things better. I can understand both sides of the argument about whether or not to tell Iris the truth. It is a grey area but I will say, for myself, I think that Iris should be told. Like another commenter mentioned, Iris is plenty at risk either way. How many times has her life been in danger already? I count at least three. She is a smart capable person and being prepared can only help her. Both Eddie and Barry would prefer that she know it all. Joe is the one who has convinced them not to. And it makes total sense for that to be Joe's position. He is her parent and protection of his kid is as natural to him as breathing. Joe may seem like simply a better liar or at least skirting the full truth. He does it very well with Iris sometimes and with Cisco in this episode. Notice how he doesn't tell Cisco everything but he does say that Barry is worried about the Reverse Flash's next move; it's the truth really. Meanwhile Eddie looks horribly guilty whenever the Flash thing comes up. No wonder Iris is convinced he is hiding something. But it's not just that Eddie is a terrible liar (not a bad thing). Joe can skirt the truth easily because he firmly believes he is doing the right thing. Eddie believes he is doing the wrong thing so of course he looks blatantly guilty every time. Barry has learned to keep his secret well with Iris too. He can talk to her about Eddie keeping things to himself and he does it with complete sincerity while also continuing not to tell the whole truth. It's such a tough question. I personally believe that Felicity is not necessarily pro-lying to Iris. I think she knows that the hero in question, Barry, has decided not to tell Iris so she is going to back him up on that. She knows it is ultimately his secret to tell, not even Joe or Eddie's really. Which makes it interesting that she tells Palmer about Barry and Barry doesn't even blink an eye. can understand both sides of the argument about whether or not to tell Iris the truth. It is a grey area but I will say, for myself, I think that Iris should be told. I think the fact that everyone knows now is what makes me want for her to know, too. It'd be different if like, Joe and Eddie were still in the dark. But I'm pretty sure Barry's third cousin's wife will know that he's The Flash before Iris does at this point. I can see both sides of the argument, though, and as much as people may hate it... it IS a superhero trope to not tell the people you care about your secret identity. (See: Oliver Queen). But it's not just that Eddie is a terrible liar (not a bad thing). Joe can skirt the truth easily because he firmly believes he is doing the right thing. Eddie believes he is doing the wrong thing so of course he looks blatantly guilty every time. YES THIS IS PERFECT AND EXACTLY WHAT I WANTED TO ARTICULATE BUT COULD NOT. Joe's in the firm belief that he's doing what is right and he can justify his lies by doing that. Plus he's a father -- you don't tell your kids everything. He's had years of practice of... I don't want to say LYING to Iris, but of keeping her safe by not telling her EVERY little thing. Eddie does not. That's why it's so difficult for him to do it. I personally believe that Felicity is not necessarily pro-lying to Iris. I think she knows that the hero in question, Barry, has decided not to tell Iris so she is going to back him up on that. She knows it is ultimately his secret to tell, not even Joe or Eddie's really. Which makes it interesting that she tells Palmer about Barry and Barry doesn't even blink an eye. Even saying all that, I found myself a little impatient with Iris this week. Does she really believe that Eddie should be telling her everything all the time? She is justified in expecting more honesty and intimacy with her boyfriend than with her dad or Barry. Fine. But her boyfriend is a cop and there will be some things he can't tell her as part of that which she should understand after growing up with Joe for a dad. And she's a journalist. What about confidential informants or some story in the future that she can't tell law enforcement (ie dad and boyfriend) about? (She wasn't shy about hiding the extent of her interest in the Flash from both Eddie and Joe.) I think she's being a little naïve about the level of communication she should expect. For example, my husband currently has an ecclesiastical responsibility at our church so he knows lots of things he can't share. There are plenty of times he comes home looking troubled and tells me that he can't tell me about it. And that is great because it is NONE OF MY BUSINESS. I can't help him bear that load and that is just the nature of life. And look at Diggle and Lyla. She was not upset at all that Dig didn't tell her about the Flash. Diggle probably didn't ask a whole lot about her ARGUS assignments. Why can't everybody just be cool like them? ;) Now they are both soldiers and understand the concept of classified. But that doesn't threaten their trust in each other. Eddie told Iris: “If I could tell you I would.” and she said that Barry made good points in their talk but then she ends by saying basically that it is not enough. That disappointed me a little and I felt bad that she would put Eddie in such a position. Felicity is a joy in the episode as always. Everyone confides in her and she gives wisdom to all although she is also good at keeping all those confidences. When Barry is crippled with worry that if he was wrong about Wells he could be wrong about anything or anyone, he trusts her judgement. She takes the reveal about Wells in stride (both she and Oliver got bad feelings about him last time they visited) but immediately feels that Cisco and Caitlin can be trusted. Generally, she knows who is trustworthy. We get that lovely bit from her where she explains in detail how she's always known she could trust Oliver, regardless of lies told. I did want her to have a bit more time with her “nemesis” but from beginning to end I enjoy her and if she's on my tv screen twice a week I'm thrilled. Even saying all that, I found myself a little impatient with Iris this week. Does she really believe that Eddie should be telling her everything all the time? She is justified in expecting more honesty and intimacy with her boyfriend than with her dad or Barry. Fine. But her boyfriend is a cop and there will be some things he can't tell her as part of that which she should understand after growing up with Joe for a dad. And she's a journalist. What about confidential informants or some story in the future that she can't tell law enforcement (ie dad and boyfriend) about? (She wasn't shy about hiding the extent of her interest in the Flash from both Eddie and Joe.) I think she's being a little naïve about the level of communication she should expect. *standing ovation* Yeah, Iris really kinda rubbed me the wrong way in that scene. It's a logical fallacy that love = complete honesty about everything, 100% of the time. She should know from living with Joe that he can't tell her everything. And Eddie DID say that he wanted to tell her but he couldn't. Why then, did she give him an ultimatum? It's like being married to a therapist or a doctor or something -- doctor/patient privilege is a thing that exists to protect the other person. And now, Eddie is trying to protect Barry's secret but also protect Iris. And he's caught in the middle of this tug-of-war because he wants to tell her, but it's not his place to. I think that's what's stopping Eddie really. So yeah, Iris needed to take a step back and say: "Look, I understand you can't tell me everything if it's related to your job. But you can always talk to me as much as you're able to, etc." or "I want us to communicate as openly as possible, even if there are barriers. I know you can't tell me everything but..."
Instead, we got Iris who firmly believes the only way you love someone is if you tell them everything. And you're right -- that was naive. And it annoyed me when she said that line because that's not how the world works, sweetie. Not at all. And if you think it is, and that's how relationships function, you'll spend your entire life alone. I did want her to have a bit more time with her “nemesis” but from beginning to end I enjoy her and if she's on my tv screen twice a week I'm thrilled. DITTO. It felt like the Brie/Felicity stuff was kind of jammed into the last few minutes but I think that her appearance is open-ended enough that she'll return. PERHAPS ON ARROW. Palmer was actually enjoyable this week and I think that is largely down to his interaction with Cisco. If I'm going to like Palmer, I'm going to have to see him defined more on his own terms rather than as just a mirror of Oliver. Watching them play together and eventually finish each other's sentences was adorable. I always love watching geeks geek out together. They really showed how much Felicity and Palmer and Cisco are similar and why they get along so naturally and it was fun to watch. And the episode showed my dear Cisco off to great effect. We got to see Cisco in full geek mode, cracking jokes and solving problems as well as the serious moments when he is concerned about Barry and having those flashes of the other timeline (which was so cool and made me wonder if it will only happen to him or will others, like Joe or Iris or Wells, have similar memories break through?). Plus, he took a bee for Palmer and showed who he truly is. “Cisco, you're a hero man.” Damn right! I think you are right that his selfless act helped Barry to trust his feelings about both Cisco and Caitlin, leading him to tell them everything. Dr Wells has saved lives but he doesn't really risk himself or his own objectives. He's sorta happy to help others as long as it doesn't cost him anything. Cisco is different because he will sacrifice himself for those he cares about or for what is right and I love him so much more every week. If I'm going to like Palmer, I'm going to have to see him defined more on his own terms rather than as just a mirror of Oliver. Watching them play together and eventually finish each other's sentences was adorable. Cisco is the kind of character who elevates anyone. Even villains are likable if they're in scenes with him. So I wasn't surprised that these two geeks took to each other and geeked out together. Ray was a bit more bearable when it came to Cisco. I just wish there was something about him that didn't rub me the wrong way, still. Even his gratitude to Cisco felt like... stiff. I don't know. ANYWAY. Fly on over to Central City all the time, Ray. No, really. ALL the time. Cisco is different because he will sacrifice himself for those he cares about or for what is right and I love him so much more every week. I just love Cisco so much, you guys. SO MUCH. SOOOOOOOOOO MUCH. He's become one of my favorite current TV characters. - the beginning where Barry is having fun catching crooks with Joe and Eddie was enjoyable. It looks like he is taking full advantage of his ability to phase through car doors, with perps no less. - “Barry Allen. Fifth wheel.” That dinner had to feel so awkward for him. - “she was forced to join me at Palmer Tech.” “It's not as creepy as it sounds.” Yeah, no. It's as creepy as it sounds. - Even Dr Wells had a big grin on his face when Felicity said “Drop the mic” Even villains, from Slade Wilson to Eobard Thawne, are charmed by her. From what I recall, the showrunners said this was supposed to be slotted before Arrow's "Public Enemy." I think I read that somewhere and it makes more sense that Felicity would be more enamored by Ray before he dropped the L-bomb and made her think about her choices. “Barry Allen. Fifth wheel.” That dinner had to feel so awkward for him. I literally tweeted: "BARRY PUPPY DOG ALLEN" during that dinner scene. Poor guy just got roped into the awkward. Even Dr Wells had a big grin on his face when Felicity said “Drop the mic” Even villains, from Slade Wilson to Eobard Thawne, are charmed by her. SHE IS JUST SO DARN DELIGHTFUL THAT EVERYONE LOVES HER. EVEN THE MOST RUTHLESS VILLAIN. I think if Ra's met her, he'd just like... bow to her and kiss her feet or something. Even Malcolm is intimidated by her. MALCOLM MERLYN. First of all, before I forget, there´s a reason why Iris isn´t looking into Dr. Wells, and there´s a reason why Cisco has this “déjà vu moments”, same reason for both, but if you are going to watch the show this summer I´ll just shut up and let you enjoy it (I haven´t closed my mouth in weeks because of that episode…. Totally amazing, and totally roallercoasteing(that´s gonna be my invented word for the sinceriously campaign Stephen has, hahaha) for your emotions. Really? Didn´t you like even a little bit Ray here? He was fun, he speaks too fast for me, in a creepy way I think (and that is something coming from me, I speak really fast usually), but his scenes with Cisco were lovely, the way they bonded… when they named this week bad “guy” at the same time was great! Although the relationship with Felicity was kind of awkward right? And then Felicity saying Barry with Oliver´s body… that was the official goodbye Ray! I actually clapped there….. Well I think I clapped in every Felicity moment, like you said, she appears and everything is ten times better!! Before Ray was in the picture, when the other possible boyfriend for Felicity was Barry I had an argument with one of my friends, because she didn´t like Barry being with Felicity…. And although I´m a Olicity shipper (a very very very very big one) Barry was so adorable, and him and Felicity had such chemistry, I didn´t mind them getting together and forgetting Olicity ship ( I know, I´m a traitor…….). For me Cisco is Flash´s Felicity….. but Barry is so similar to Felicity too!! They will be a perfect couple, but with that not being on the table, they make the best friends ever, so compatible! I don´t understand Iris…… I don´t want to compare her to Laurel, because sometimes I think I have a problem with who they put as the hero love interest, but sometimes I have to. When Barry spoke with her I thought: “perfect! Now she thinks Eddie doesn´t tell her about the worst things of his work, and she will try to help him deal with that, not by making him talk about it, but by leaving him alone and trying to cheer him up…..” Well … wrong! Just the opposite! Really Iris? That´s the almighty attitude I don´t like in Laurel… So poor Eddie… I´m starting to like him more… and I didn´t really understand why he had to know about Barry, it was totally unnecessary …Maybe so they can create this crisis with Iris…. I've totally been watching all season and thank you for reminding me that Eddie gave Iris a crappy excuse as to why the reporter dude was gone. Is that why she stopped investigating? Because he died? (Well, she still doesn't know he disappeared and thinks he went to another country to chase after a girl.) I couldn't remember if there was ACTUALLY a reason or if we just dropped that plot point. Really? Didn´t you like even a little bit Ray here? Ehhhhhh. I'm at the point where I'm tolerating Ray, like Oliver is tolerating him. I still hold fast to the belief that if he was introduced in a spin-off rather than him going to a spin-off, I might like him more. Still, that line about buying out the company? THAT WAS A CREEPY THING TO DO, RAY, STOP SAYING IT WAS NOT. I did very much like that Cisco found a friend in Ray though. I want them to hang out because I actually tolerate Ray when Cisco is around. That's pretty much where I was at this episode. I can deal with Iris for the most part, but she's a very weak character IMO. We know more about the depth of Caitlin and Cisco's families and their career goals than we do Iris. I don't get WestAllen for that reason: other than the fact that Barry loves her, WHAT is so compelling about that ship? That... they've been BFFs since childhood? I want to know WHY Barry is in love with her, not just THAT he is in love with her. Give me an entire episode about how Iris struggles in the absence of her mother. Give me a flashback!Iris episode like we got with Felicity in Arrow. Give me an explanation as to why she wants to be a journalist. Give me ANYTHING about her character other than "Barry is in love with her and therefore you should love her too." So yeah, I have some problems with the way Iris is written, haha. She has some strong moments but I can't care about her all that much beyond those few isolated moments because after eighteen episodes, I still feel like the only things I know about her are that a) she's a journalist, b) she's Barry's best friend, and c) she's... curious? Knows how to use a gun? Smart? There's just not much else there. I think in the "new day" after Barry went back in time, Iris´boss gets interrupted by Barry just in the moment he was going to tell Iris about Dr. Wells... so she doesn´t know what his boss was doing.... (I think so.... It was such a shock of episodes that I´m not totally sure). Great recap, but on my second watching I came to a single conclusion: Iris is being a bad girlfriend to Eddie. If she trusted him, she could accept that the secret he has will be hers when he can give it to her. If you trust and love someone, you don't drop ultimatums and punish your love. Currently, Eddie deserves better and so would everyone else. Joe told Barry that lots of people do stupid things for good reasons. That is what everyone does with Iris. Joe could tell Iris that Eddie’s secret is his, it is only about police work, and he will tell her the moment he can. Then it is all over. The result is she huffs and puffs and gets her own place, lives with her Joe making his life miserable asking questions, or she goes back to Eddie. Regardless, Eddie would be off the hook. Why not? Joe is avoiding the problem and pushing Eddie into it, because he doesn’t want Eddie and Iris together. Stupid things. Good reasons. And yes, Ray was easier to take in Central City. I just want to open this comment with saying I recently discovered this blog and I really love your great, thought out reviews. It's a pleasure to discover a place where you can have open discussion about some of your favorite shows, lol. The first thing that annoys me about this secret being kept from Iris (before I become rational and give it legitimate thought, haha) is that it's three males deciding to keep something from/make decisions for a female. Yeah, Joe is the one who initiated the secret keeping in the first place, but I've had issues since the beginning of the series with how Iris and Joe's relationship has been portrayed, and those issues grow larger as the season progresses. From the forbidding her from becoming a cop, to pushing Barry to lie, to not wanting her to date Eddie, Joe's actions toward his daughter come off more controlling versus caring especially when the show doesn't really offer us any other insight into his relationship with Iris, and especially when you compare his treatment of Iris with the very layered relationship we see he has with Barry. There's an argument that Iris can't protect herself, and Eddie and Joe can because they're cops. But Iris is the daughter of a cop, is dating a cop. Removing the superhero element, Iris is/would be/could be a target based on those two issues alone. It's a different level of danger, but it's danger nonetheless. The biggest issue with Iris though, is that the writing has done a very poor job of establishing who she is and what her motivations are, to the audience, which is why many are having a difficulty connecting with her and her actions. Because of poor writing, it's easy to forget exactly who Iris is to both Barry and Joe and it becomes difficult to empathize with exactly what she's going through. Joe and Barry are her family. Whether Iris is the Love Interest or not, Barry once upon a time was her best friend. She protected him when he was bullied when they were kids. They grew up together. They've known each other their entire lives. Growing up, they were a united front against whatever life threw at them. Again, outside of being the Love Interest, more importantly, Iris is family. So to be on her side of the fence, it can't be easy knowing that the most important people in your life are keeping something from you. Again, she knows her dad. She knows Barry. For years. So I'd think she'd know the difference between the two of them keeping job related things from her, and them keeping other things from her. She grew up in the home of a cop, so I'm sure she gets that as a civilian she's not always allowed to know exactly what's going on. She knows what that kind of secret keeping is, and I'm guessing (forced to guess b/c the writers aren't exploring Iris) she can instinctively tell that this is different. I also don't know what they hope to achieve long term by keeping Iris in the dark. Again, Iris is Barry's family, Joe's daughter. So she'll always be a part of Barry's life. And being the Flash is a big part of Barry's life now. Even if Barry hadn't decided to use his powers to do anything heroic, he'd still have them. Being The Flash is what he does, but being a Speedster is now who he is. Does he plan to keep her in the dark about that forever? For me the issue isn't necessarily should Iris know that Barry is the Flash, but instead should she know that this person she loves (and I'm not even talking romantically), the person whose bedside she sat by for what? nine months hoping and praying he'd wake up, underwent this major transformation, and doesn't think enough of her to share this experience with her. I can't fault Iris for jumping to crazy conclusions, and acting a bit batty, when she's been living for months with the anxiety of knowing that the people she trusts most implicitly are keeping something from her, yet keep telling her/treating her like she's crazy any time she brings it up. You say Cisco and Caitlin get to be let in because they work with Barry, essentially that they're his team, but Joe, Iris, and Barry are a team too, were a team for years, teaming as a family unit, helping each other get through life. And it's the writers' fault that we haven't seen much of these characters as this family unit they've been painted to be. Sorry for the (waaaaay) too long comment, lol, but the way the writing staff of The Flash have mishandled Iris, just really grates for me.